Posted on Fri, Mar 30, 2012 : 12:20 p.m. While 200 American Red Cross workers throughout Michigan are on strike, the Washtenaw County blood services will be operating business as usual. Donna Duvin, executive director of American Red Cross of Washtenaw County, said the southeastern Michigan region is "not part of that strike effort." 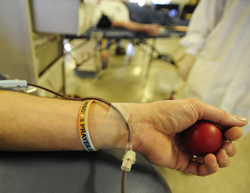 The American Red Cross Great Lakes Blood Services Region, which includes 65 counties, has workers on strike in a dispute over contract negotiations. The Office and Professional Employees International Union Local 459 and Teamsters Local 580 representing the striking staff members. “One of the primary issues on the table is health benefits,” said Bridget Tuohey, communications manager for the southeastern Michigan Blood services region. “American Red Cross has offered the health care benefits package that matches the hourly and salaried non-union employees of the Red Cross. They have not accepted those terms." Washtenaw County, along with Wayne, Oakland, Macomb and St. Clair counties, make up the southeastern region of the American Red Cross. The strike has caused some blood drives to be canceled or rescheduled in the Great Lakes region. Tuohey said 18 other regions have settled with the new health care benefits and contracts. "We’ve had no intent to strike," Tuohey said. "We’re just relieved and gratified that were not part of the striking regions. Our mission is to provide blood to people and our local hospitals and strikes can make it difficult to have an adequate blood supply." Fri, Mar 30, 2012 : 9:49 p.m.
Fri, Mar 30, 2012 : 9:28 p.m.
Too bad another organization under union dupedom..thank god for the salivation army ..
Fri, Mar 30, 2012 : 8:39 p.m.
Red Cross workers on strike? Is nothing Sacred? Sat, Mar 31, 2012 : 12:09 a.m. I'm afraid that I've never been a fan of the Red Cross since they did so much to frustrate testing of the blood supply during the early years of the aids crisis. This is a tax-exempt organization that pleads for your blood donation and then turns around and sells it at a profit to hospitals; who pass that cost along to people in need. This is a business -- and not a particularly ethical one at that. Fri, Mar 30, 2012 : 4:38 p.m.
No no quotes from Union Official or their side of the issue. MORE lame reporting with a built in bias. Thanks yet again A2 Dot.